(LabourStart) – This sounds more like a horror movie than one of our usual campaigns on LabourStart. But it’s all true. A few days ago, a leader of a new union at Samsung in South Korea named Yeom Ho-seok took his own life to protest the vicious anti-union policies of the company. At his funeral, 300 police stormed in, arrested 25 mourners and absconded with his body. That’s right: the police took away Yeom’s body. The police apparently cremated the body against Yeom’s dying wishes, and have meanwhile jailed two other leaders of the Samsung workers union who dared to protest the raid on the funeral. 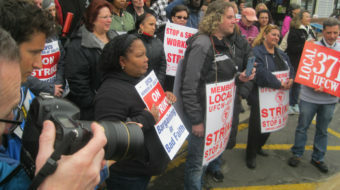 All this takes place against the background of the attempts by workers at electronics giant Samsung to organize a union. The workers have been on indefinite strike. Samsung workers have the right to a trade union. Their union, the Korean Metal Workers Union, has launched a big campaign online demanding that the Korean president intervene to release the prisoners, end anti-union repression at Samsung, and launch an independent investigation of the police raid and body-snatching. Korea President Park Geun-hye, Samsung Group management and company Chairman Lee Kun-hee want to take the country back to the dark days of its authoritarian past. The workers have asked Samsung to stop labor repression and recognize the union, for employment security at the three centers with concentrated union membership, to pay a living wage and to bargain a first collective agreement. In partnership with IndustriALL, the International Trade Union Confederation (ITUC), the Korean Metal Workers Union and the Korean Confederation of Trade Unions, LabourStart is conducting an international solidarity campaign. Please click here to send your message of support to the Korean Samsung strikers and to tell President Park to release the prisoners, stop anti-union repression at Samsung and investigate the police raid and body-snatching. 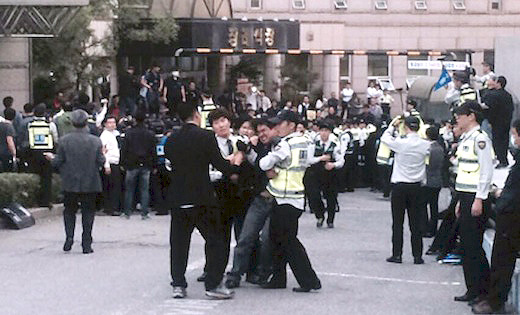 Photo: Police storm Yeom Ho-seok’s wake and abscond with the union leader’s body while arresting dozens of Samsung union members (via Korean Metal Workers’ Union).